We hope we won’t have to cancel any more rehearsals for snow this winter! Members should be sure to check the website and watch for email messages and/or Facebook notices on Mondays when severe weather threatens. P.S. Don’t forget that we are always looking for new singers, especially tenors and basses. Every chorus needs new voices, but we want them to sing with us! Please don’t let any possible singers slip by. The Rappahannock Choral Society will be holding open rehearsals and auditions on Monday nights, through the month of February, 2019. Interested singers should come to any rehearsal at the Zoan Baptist Church, 5888 Plank Road (Opposite the Harrison Crossing – Giant/Home Depot – Shopping Center). Rehearsals begin at 7 PM. Please come a little early to meet some of the singers as well as our new young talented and energetic Conductor, Dr. Jordan Davidson. Interested singers are welcome to sit in and sing at the rehearsal. For further information, please call Linda Monner, President at 540-412-6152. Information about the very simple audition process can be accessed on our website, www.rappahannock-choral-society.org by clicking on “Sing with us” at the top of the page. Interested singers who cannot attend the OPEN REHEARSAL or or have a conflict with the dates can call 540-412-6152 or contact the Conductor directly at rcsconductor@gmail.com for information. For seven very successful years, Linda Monner has conducted the 65-voice Rappahannock Choral Society to the delight of thousands of music patrons. In July, Mrs. Monner, one of the founders of the RCS, plans to retire as Conductor/Music/Artistic Director after the 2017-18 concert season. “Although I’m ready to turn over my conducting baton, I plan to stay active with the RCS in whatever advisory role I can, including helping lead the search for a person to take over the music leadership,” Monner said. The search for a Conductor/Music/Artistic Director produced a number of candidates, according to RCS president David A. Covington. “Linda has been the heart and soul of the RCS from the very beginning. Her inspiration on the conductor’s podium and her ability to bring forth the very best from every one of our singers is not only superb, but unique. Finding her successor was a big challenge,” Covington added. Look for information on our new conductor shortly. Linda plans to stay active with the RCS in a supporting role. Her legacy of achievement will leave RCS well-situated to continue making “Great Music…Close to Home”© for many years. The Rappahannock Choral Society announced the winner of the $500 2017 Anne E. Parker Memorial Scholarship, OLIVER KRISKA, a senior attending Chancellor High School, at the Spring 2017 concert performance on Saturday, May 12th at Chancellor High School. 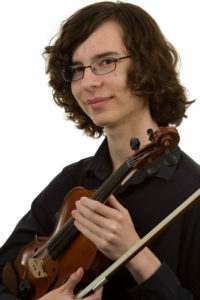 Oliver has been playing violin for nine years and piano for five years. He is the Concertmaster of his school’s Symphonic Orchestra and plays in the electric orchestra, string quartet, and pit orchestra for musicals. He is also a member of the University of Mary Washington Philharmonic Orchestra. Other hobbies Oliver enjoys include drawing, playing ukulele, performing with a rock string group, and entering LEGO building competitions. This fall, Oliver will attend James Madison University to double major in Music (violin performance) and Chemistry. I have heard many, many accolades pertaining to our concerts. This one really ‘struck a chord’! Beautiful, beautiful concert…the voices blended perfectly, enunciation fantastic! A lovely mix of holiday music!!! Wonderful concert … even tones of the chorus; smooth, even, blended music; the little bit of humor was just right … perfect for the tone of the concert, the crowd was fantastic! This was the best one yet! AWESOME job last night!!!!!!!!!! I am so glad I came! I am listening to your 2010 Christmas cd now. I am disappointed that I didn’t come last year to hear it! IT is so GOOD!!!!!!! I am looking forward to the Spring Concert. Thanks for forwarding the link to the flash mob performance…your timing was perfect this Christmas Eve because exactly 60 Christmas Eves ago, my wife was in the balcony chorus at St. Patricks Cathedral singing Handel’s Messiah. The memory always brings a tear to her eyes (and mine) when we hear it. Thanks for the memories. My wife four children and I thoroughly enjoyed the concert. Thank you for providing such wonderful entertainment! …she had a beautiful voice and her range, if she was an alto, was even better. Great program. I really enjoyed your concert last Saturday, you all did a great job. My wife and I attended your concert Sunday. It was fantastic! Your medley from the 60’s brought back many memories. …Oh, the RCS last Sunday afternoon was absolutely wonderful. Wow … Great …! Loved the stage decorations too! This site is built on the Genesis Framework - eleven40 Pro Theme.